Eugene Walter Baker (June 15, 1925 – December 1, 1999) was an American Major League Baseball player. A native of Davenport, Iowa, he primarily played second base for the Chicago Cubs and Pittsburgh Pirates. He was selected for the National League All Star game in 1955. He played eight seasons from 1953 to 1958 and 1960 to 1961, threw and batted right-handed, and was listed at 6 feet 1 inch (1.85 m), 170 pounds (77 kg). 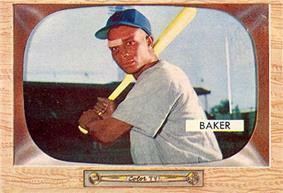 Baker was a reserve infielder for the 1960 World Series champion Pirates and made three pinch-hit appearances during the Series. In 1961, Baker became the first International League affiliate Columbus Jets. In 1963, the Pirates promoted him to coach on the Major League team. He was the second black coach in the big leagues, following Buck O'Neil by a half-season. Baker then spent many years as a scout for the Pirates. ^ "Baker Bows in Manager Debut". Chicago Defender. June 21, 1961. ^ "Pirates Reward Baker for Batavia Job; Move Him Up as Player-Coach for Jets". Pittsburgh Courier. January 13, 1962. ^ "GENE BAKER MADE PIRATE COACH". Pittsburgh Courier. February 2, 1963.